And now, in response to Susan’s request, the recipe for the Crisp Pickled Green Beans from Better Than Store Bought by Helen Witty and Elizabeth Schneider Colchie. 1979. Harper and Row. $12.95…back when I bought it. 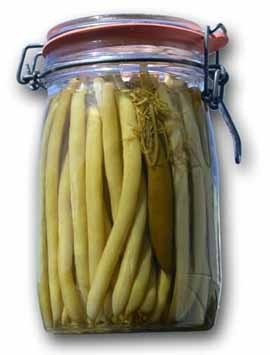 Cutting cleanly through all the “free of harsh acidity and inappropriate sweetness…[and] set off by a touch of dill” blather, I’ll advise you to get jars appropriate for the length of the beans. Conversely, you may wish to get beans appropriate for your jars, but this is likely to prove more tedious. What you do want, though, are beans with a straight life-style, as, believe me, they are vastly easier to arrange presentably. A technique I’ve perfected at farmers’ markets with sharp eyed vendors is a smoothly flowing raking motion with the fingers spread apart. With practice, you can with no visible pause allow imperfect specimens to escape through your fingers back into the bin as your hand moves toward your open bag and deposits the survivors. In subsequent passes, you can wriggle the fingers to delve into lower layers of beans and bring them gently to the surface. However, to make all this look realistic, your hand must arrive at your bag with at least three beans still in it. Subtitle: How to Shop Like a Chinese Grandmother without Actually Being One. Do I have to tell you to wash, drain, and stem the beans? or that “the tender tip ends needn’t come off”? The more I look at this recipe, the more useless filler I see. Yes, we do want the garlic cloves peeled, as this makes them more palatable. And yes, I suppose the folks up in Outer Wretchedness could substitute dried red pepper flakes for fresh chiles and dill seeds for the fresh dill, but I prefer to make this recipe when I can get fresh ingredients. And that said, since the bean season starts much earlier and ends much later than the chile season, i’ve taken to using dried chiles except in the middle of the summer, and i routinely cheat and use dill seed much of the year. So anyhow, into each jar throw fresh chiles, garlic cloves, and sprigs of dill, the amount of each determined by the size of the jar and how hot, garlicky, and dilly you want the beans. Then add as many beans as you can fit in without mangling them (they shrink a bit during processing). Quickly cap the jars and place them into the already seething cauldron. Clap the cover on immediately and process (old canner’s jargon meaning “leave in there”) for five minutes after seething has resumed. Fish the jars out and briefly loosen and re-tighten the lids to ensure a tight seal as they cool. Note: Just to bring a smile to my doctor’s face, I have to tell you that these things are actually better with a third of that salt, 1 tablespoon to 3 cups of water.. I’ve also started backing off the vinegar to 1 part of vinegar for 2 parts of water, and reducing the processing time when I’m using more tender beans. Finally, I sometimes use tiny onions or green onions in addition to or instead of the garlic. You might want to try these ideas. More notes: I also pickle okra using the above recipe and find that folks who don’t like okra any other way enjoy the pickles. And finally, I’ve started pickling Brussels sprouts, but for them instead of fresh dill I use a mixture of dill, celery, and mustard seeds. Also, unlike the beans and okra, the sprouts need to be processed somewhat longer. Try 8 minutes instead of 5, but we don’t want them all mushy. Even later note: I also pickle hot peppers with this recipe, and for hot peppers, it’s definitely a good idea to invert the jars once they’ve sealed. That way the tops that inevitably stick out of the pickling solution will get fully pickled before you give the jars away. And a final note: In recent years i’ve started pickling sugar snaps and snow peas, which of course need to be stringed beforehand, but these are so tender that they don’t need to be processed at all if you make sure to use sterile jars since i don’t think many pathogens will survive having boiling, salted vinegar poured over them and then being stored in that salted vinegar solution. OK, an extra-final note. I’ve now pickled asparagus. The trick here is, as for the sugar snaps and snow peas, zero processing time, as just pouring the boiling pickling solution into the jars is enough to cook the asparagus without leaving it limp.